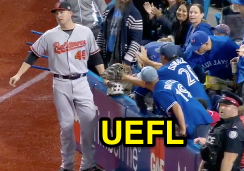 A batted ball deflected into the stands in Toronto concluded with the batter-runner awarded third, not second, base as umpires considered an odd sequence caused, in part, by Rogers Centre's turf and short right field wall. Trumbo loses a baseball into the stands. The Play: With none out and none on in the bottom of the 2nd inning of Monday's Orioles-Blue Jays game, Blue Jays batter Teoscar Hernandez hit a 2-2 splitter from Orioles pitcher Ubaldo Jimenez on a fly ball to right fielder Mark Trumbo, who misjudged the fly, which fell untouched and bounced toward the short wall along the right field line. As Trumbo retrieved the baseball, which had bounced off the top portion of the wall and back into play, Trumbo deflected the ball out of play, resulting in a dead ball as called by 1B Umpire Brian Gorman. Officially scored a double and error on Trumbo, Hernandez was awarded third base. Case Play Question: Replays indicate that Trumbo deflected or lost the ball as Hernandez rounded second heading for third base; HP Umpire Chris Segal held up two fingers (as in "two bases") as Hernandez crossed home plate, seemingly pointing at second base before Gorman elected to place Hernandez at third base instead. Is awarding batter-runner Hernandez third base the proper result for this play? Should he have been awarded second base; could he have been awarded home plate? Answer: Regardless of the timing of the award, Rule 5.06(b)(4) specifies that all runners shall be awarded two bases if a fair batted ball deflects or is thrown out of play. B1 Hernandez thus will receive a two-base award, but the only question is from what point? If a fair ball not in flight is deflected by a fielder and then goes out of play, the award is two bases from the time of the pitch. If a fielder has complete possession of a batted or thrown ball and subsequently deflects or kicks the ball out of play, the award is two bases from the position of the runners at the time the ball was kicked or deflected. If a fielder has complete possession of a batted or thrown ball and drops the ball while he is out of play, or if he drops such a ball and it then goes out of play, the award is two bases from the position of the runners at the time the ball was dropped. If, in the judgment of the umpires, a fielder intentionally kicks or deflects a batted or thrown ball out of play, the award is two bases from the time the ball was kicked or deflected. When F9 Trumbo turned his back to U1 Gorman in an attempt to play the ball, the subsequent action of the ball slightly descending into Trumbo, only to again parabolically ascend and find its way out of play likely suggested that Trumbo had gloved the ball and dropped it "on the transfer," which suggests possession. Accordingly, the prescribed award is two bases from the time of deflection/drop. By rule, if Trumbo did not have complete possession and did not intentionally kick or deflect the ball out of play, the award is from time-of-pitch. Regardless, the award is from either time-of-deflection ("time of throw") or time of pitch. It appeared the runner had achieved second base at the time of the deflection, which means there are two possible base awards for this play: second (time of pitch), or home (time of deflection or throw). For the runner to be placed on third base suggests the umpires ruled that B1 Hernandez had not yet achieved second base when Trumbo, with complete possession or intentionally, deflected the ball out of play. Runner placement is eligible for Replay Review, but determining whether the deflection was intentional is not eligible for review. This play is not subject to spectator interference—which is the only way a "nullify the act" ruling could be made—as no fan touched the live ball over the playing field; the award for a deflected ball out of play is strictly two bases from time-of-throw or -pitch, as delineated above. Note that such a sequence as occurred here is likely only possible in two MLB stadiums: Toronto and Tampa Bay. Chances are with a real grass and warning track configuration, the ball will not bounce in such a lively fashion as to have such momentum that brought it to be deflected out of play. OBR 5.06(b)(4): "Each runner including the batter-runner may, without liability to be put out, advance:"
- - - (F): "Two bases, if a fair ball bounces or is deflected into the stands outside the first or third base foul lines; or if it goes through or under a field fence, or through or under a scoreboard, or through or under shrubbery or vines on the fence; or if it sticks in such fence, scoreboard, shrubbery or vines." - - - (G): "Two bases when, with no spectators on the playing field, a thrown ball goes into the stands, or into a bench (whether or not the ball rebounds into the field), or over or under or through a field fence, or on a slanting part of the screen above the backstop, or remains in the meshes of a wire screen protecting spectators. The ball is dead. When such wild throw is the first play by an infielder, the umpire, in awarding such bases, shall be governed by the position of the runners at the time the ball was pitched; in all other cases the umpire shall be governed by the position of the runners at the time the wild throw was made."